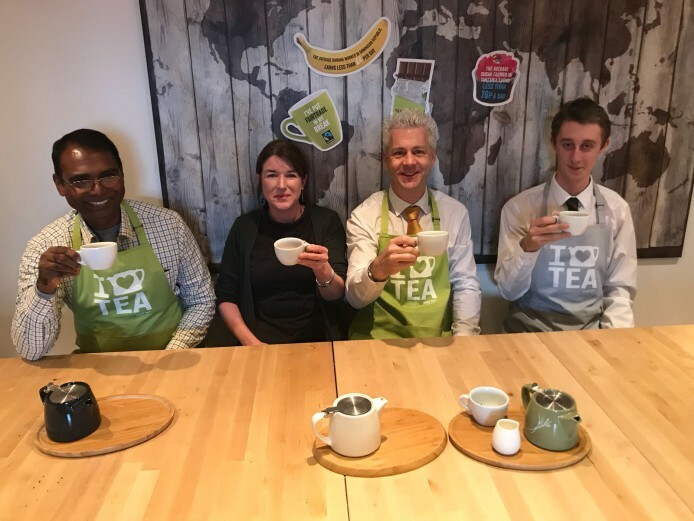 "Fairtrade means a decent and justified price, matching the cost of production to bring farmers a sustainable income.” As Fairtrade Fortnight continues, last week we hosted a very special visitor at Suki Tea HQ. Fr. John Joseph, a coffee and spices producer from India, who is travelling around the UK to help promote Fairtrade Fortnight joined members of Belfast’s Fairtrade Committee and shared his experiences as a food producer in India. In addition to producing coffee and spices (his range includes pepper, cardamom, ginger, turmeric and cloves), Fr. John Joseph is also an ordained priest and qualified lawyer with over 20 years’ experience working with marginalised and rural communities in India, particularly small-scale farmers, tribes, women and children. A very interesting man, he shared many stories with the team about his work with the WSSS Organic Farmers Fairtrade Association (WOFFA) and how buying and selling Fairtrade products benefits local communities and helps to support and change the lives of families, farmers and producers in India for the better. Fr John founded WOFFA in 2008 with 400 small scale farmers in the rural Wayanad region of Kerala, India, well known for its panoramic views and the diversity of indigenous tribal communities. The association was formed out of the need to organise, gain knowledge and tackle social, economic and environmental challenges facing farming families. Under his leadership, WOFFA has now grown to almost 8,000 registered members - all of which are certified Fairtrade and Organic farmers – who are organised under 450 village groups. WOFFA is now the biggest Organic and Fairtrade producer organisation in India. The farmers are helped to create a positive cycle of investment to ensure better productivity and storage, whilst having that backing and support to progress. As an organised sector of agricultural communities, the farmers take part in ongoing training and workshops which update traditional knowledge of good farming practices, to the more modern ways of practice, It's nice to hear that 20% of the total members of WOFFA are women farmers, most of who now own their own land and decide how their income should be spent. Much like the amazing Farmer Zoë and Annie met on their recent trip to Rwanda, an amazing 70 year old lady who they spent the afternoon learning from (keep an eye on our blog and journeys for updates on this!). Fr. John Joseph and the members of Belfast’s Fairtrade Committee were treated to a special Fairtrade Tea tasting as well as some special Fairtrade goodies (chocolate of course!) and Annie spoke about our products, the importance of ethical sourcing to Suki Tea and the efforts we make to support Fairtrade where and when we can - we are proud to report that 90% of our plain black tea, green tea and Earl Grey tea sales are Fairtrade certified. Later that day, Annie attended a special Fairtrade Fortnight reception at Belfast City Hall hosted by Lord Mayor, Councillor Nuala McAllister. Fr. John Joseph and members of Belfast’s Fairtrade Committee spoke at the event which was aimed at encouraging greater engagement with Fairtrade initiatives among councillors. Last week Annie attended a Fairtrade event at Our Lady and St Patrick Primary School, in her home town of Downpatrick. This event celebrated Fairtrade Fortnight and provided a fantastic opportunity for pupils to learn more about the benefits of supporting Fairtrade products. 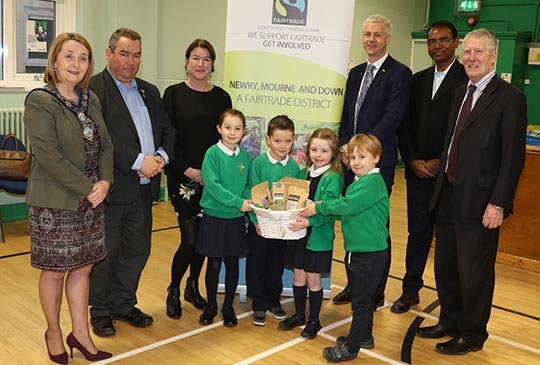 The topic of Fairtrade is now part of the school curriculum meaning primary school children are learning about the ‘World Around Us’ and the importance of our planet. Through hearing Fr. John Joseph’s stories, these pupils learned that people in the developing world have similar aspirations to them, Fr. John Joseph explained how they too want to succeed in life, to fulfil their potential, be happy and to be treated fairly. The children were encouraged to think about buying Fairtrade products when out shopping at the weekend, showing that by choosing Fairtrade they too, could play a part on helping these people to achieve their ambitions.